It allows you to scan the device and show the complete information of the connected device. it also allows you to boot the device into the adb or fastboot mode. it also allows you to exit the fastboot mode on your android device. 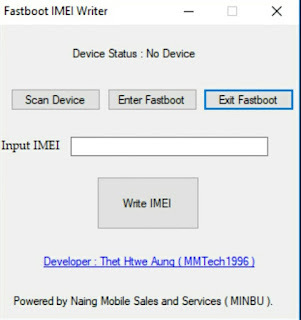 in order to use the fastboot imei writer you need to install the Universal Adb Driver on your computer. Once you have sucessfully installed the adb driver on your computer, you need to connect your android device to the computer using the usb cable. once your device is connected to the computer, launch the imei writer tool and input the imei number and click on the write imei button.